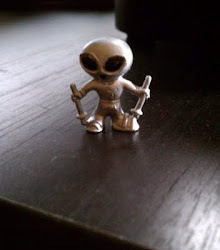 I've started a new companion feature to "High Strangeness -- The Blog" that I hope you all will enjoy. It occurred to me the other day that there are about a billion websites where you can see pictures of UFOs any time you want to, but there's no place to go to read a good UFO Quote. 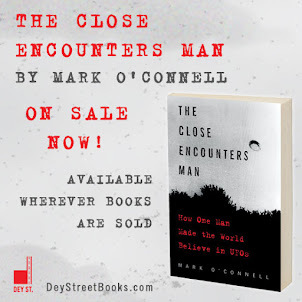 So why not gather together the very best of the things people have to say about UFOs and deliver one to my audience every day, via my twitter account? Think about it. Those UFO photos you all look at day after day on other websites? They all look pretty much alike after a while. Globs of light in the sky... Dark, fuzzy shapes... Orbs... The occasional alien corpse... What is the point of looking at more and more and still more indistinct photos of UFOs every day? Where does it get you? Quotes, on the other hand, are always different! Different people say them, and they use different words. What's more, different people have different levels of understanding and education and different ways of expressing themselves. Some of them believe that UFOs are real objects from beyond space, and some don't. Some of them know exactly what they're talking about, and some don't. Some of them don't even speak English! That's what makes it all so fun! "Ridicule is not a part of the scientific method and the public should not be taught that it is"
This has always been my favorite UFO quote, so it made a fitting debut for my new feature. Hynek first uttered these words at a gathering of scientists in 1952, and it was kind of a big deal. 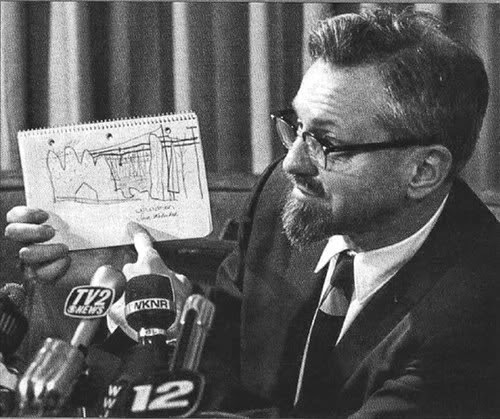 Hynek, "small potatoes" as he was in 1952, was really going out on a limb... No scientist had ever before spoken out so forcefully in favor of a scientific study of UFOs in front of a gathering of his peers. It might have killed the career of any other scientist, but Hynek was a special case, which is why I'm writing a book about his career. Often I like to read the whole piece in which the quote originally appeared. Having a quote detached from its source makes me doubt its legitimacy. For instance, the internet is loaded with quotes falsely attributed to various American "founding fathers." That would be the ideal, but with only 140 characters I can't always do it.